Steven Zugelder is a graduate of The Eastman School of Music, receiving his Masters and Undergraduate Degrees in Performance and Education and was a student of John Marcellus and Mark Kellogg. After Graduating from Eastman in 2001, Steven continues to reside in Rochester and is an active performer and teacher. Since 2010 he has held a teaching position at Nazareth College where he has a successful trombone studio, directs the Nazareth College Trombone Choir, Symphonic Band and the Pep Band. He has been featured as a trombone soloist with a variety of ensembles. In 2011, he was a featured soloist, performing “Bolivar” by Eric Cook with the Nazareth Wind Symphony as they performed on an Eastern USA tour. In 2007, Mr. Zugelder performed “Blue Bells of Scotland” by Arthur Pryor and as a featured soloist with the Greater Rochester Music Educators Wind Symphony. In 1997 he performed the Launy Grondahl “Concerto for Trombone,” with the McAlester High School Band at the Oklahoma Music Educators Convention. 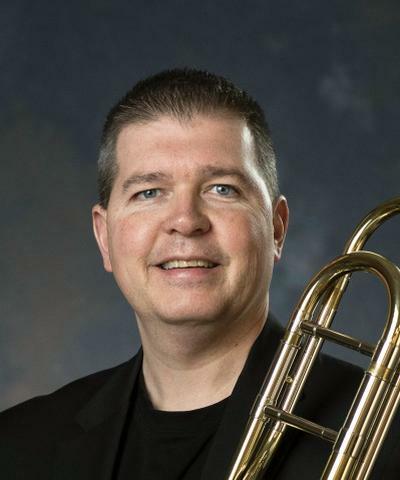 Steven served as the Principal Trombonist in the Opera in the Ozarks Orchestra, Eureka Springs, Arkansas, from 1996 through 1999. He has performed with several orchestras including the Buffalo Philharmonic, Syracuse Symphony, Utica Symphony, Rochester Oratorio Society Orchestra and the Gregory Kunde Choral Orchestra. Steven is also an active chamber music musician performing with the Wilmot Brass Quintet at Nazareth College. In addition to teaching at Nazareth College, Steven is the K-12 Coordinator of Music and Director of Performing Arts in the West Irondequoit Central School District. Eastman School of Music, B.M.